Matthew's Blog at Workshop Heaven: Lateral Thinking ! 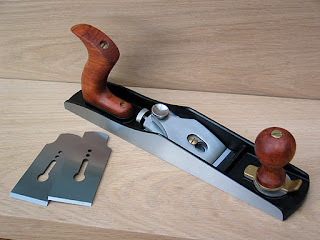 One of the minor points levelled against bevel up planes is that their capacitity for lateral adjustment is limited becuase the cutting iron is nestled down between the side wings. Here's a quick and easy way to give your bevel up plane as much lateral adjustment as a bevel down one. First mark up the sides of the iron with a permanent marker so that you can monitor your progress. A nice even taper running from about halfway up the iron to the shoulder, taking about 1.5mm to 2mm out of the width on each side at the shoulder. 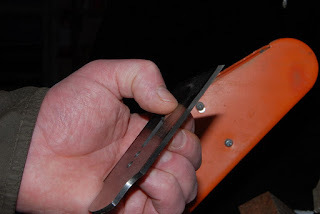 About twice as much adjustment as you had with the parallel sided iron, and the front end remains parallel so it will still fit into a side clamping honing guide. The Quangsheng iron I am using here is differentially hardened carbon steel (only hardened from the slot down so that the soft upper part dampens vibration). 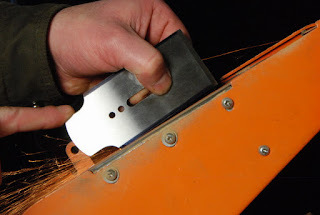 Air hardening steels are all or nothing, so if you try this with an A2 blade the whole thing will be hard and it may take a little longer to grind back. In my opinion this is not a tweak I would recommmend, most certainly not for the Veritas/LV LA Jack. With this plane there is 1.5mm each side of the blade. The gap is taken up setscrewes. There is no need to widen the gap with the body. As I recall, the gap for the LN LA Jack is similar. I suspect that the problem you are trying to fix is only with the Quangsheng. Hi Derek, Thanks for your comment, as you know I hold your opinion in the highest esteem. I've tried the QS shoulder to shoulder with the LV and the ex-works lateral adjustment is approximately the same. 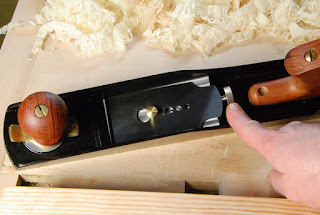 Indeed we have received comments about how much better the lateral adjustment on the QS is compared with the Stanley equivalent, which has a tendancy to slide left and right rather than pivot (lever cap issue?). It seems to be more of a general concern about low angle planes as opposed to bevel down ones and the answer to me seems obvious. I have seen the same blade shape in old woodies where the lateral movement is also potentially restricted by the sides. I'm still trying to work out if the set screws on the LV offer a genuine advantage or if they were a workaround for the problem that Stanley are having. Norris used to put a bump on the inside of the casting in the same spot. Any light you can shed would be most welcome. It's not only the blade - it's also the sheer inefficiency of the norris adjuster for lateral adjustment. Bailey got it right all those years ago! 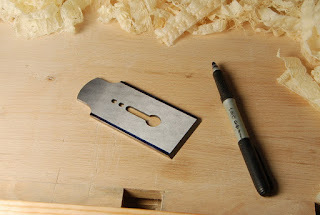 The seperated functions of lateral adjustment and blade advance are indeed one of the advantages of the conventional bevel down plane. Bevel ups have advantages too - lower bedding angle, lower centre of mass etc. I guess it's up to each individual to choose the tool that best suits their needs.